5 available as of October 2, 2013. Raised here from babies in 2011, they are now 6.5"+ size and absolute beasts. I've had my Black Burmese for a few weeks short of a year. He has doubled in size (~6"), and remains healthy, active and inquisitive. I've since made other purchases from Tyler and am pleased with all of them. I have had my Burmese for several weeks now and it is a healthy, thriving and rapidly growing animal. The shipment was unbelievably well packed to protect the animal during transit. As soon as the tortoise was out of the container it was busy eating and exploring. Tyler was excellent to deal with and I'll be buying from them again. After seeing a family member's Sulcata tortoise, we were set on getting a large tortoise. We did plenty of research on what kind exactly and set our sights on a Burmese Black Mountain Tortoise. After looking at all the breeders, Tortoisesupply.com definitely seemed like the best. We emailed back and forth with Tyler for a few months before meeting at the reptile show in San Diego. He answered all our questions about habitat, behavior, and feeding. He and his family were patient while we carefully examined each tortoise and helped us determine which tortoise we wanted. We have had Ballast the tortoise for about two weeks now and he is in perfect health and is so great to have! He is very active and personable. Tyler and his wife could not have been more helpful! We will definitely continue to do business with Tortoisesupply.com! Habitat: These tortoises prefer heavily planted enclosures with heavily shaded areas. They don't handle weather extremes very well, and should ideally be kept between about 60-95 degrees. Moderate to high humidity is preferred by them, and they like shallow water dishes of pools to soak and drink in. They do not truly hibernate, but will go through a winter slow down period during cooler weather and shortened daylengths. As adults, they can safely handle body temperatures as low as 50 degrees at night as long as they are able to heat up into the 70's during the day. Summer highs up to 95 degrees can be tolerated as long as there is a cooler, shaded retreat the tortoise can get into. 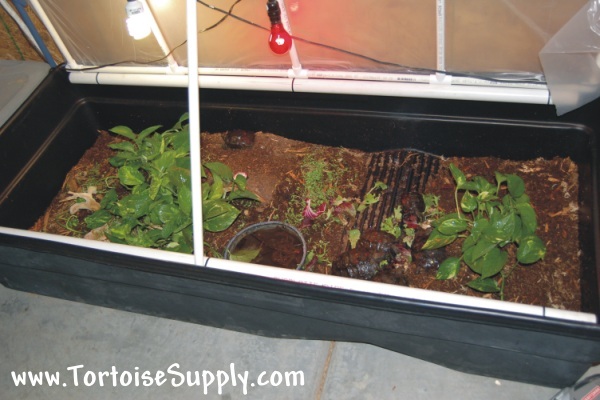 Moisture is not a problem in warmer temperatures (a cool mud hole on a hot day), but in cooler weather and on cold nights, the tortoises should be kept more dry. An example of how we are raising babies is shown at the bottom of this page. Adult Behavior: Often referred to as the "puppy dogs" of the tortoise world, Burmese mountain tortoises have a long standing reputation as friendly tortoises that are very interactive with their owners. Because of their eventual size, this species should only be considered by someone in a humid climate (or someone that can create a humid climate) ideally in a Southern state where this large animal can be maintained most or all of the year outside. It is not easy or reasonable to house them indoors long term, or over a long winter. These tortoises love rain during warm weather, and will become more active during rainfall. The Burmese mountain tortoises are also the only tortoise to "build nests," much like an alligator will. They will gather leaves, branches and debris from around their enclosure (over the course of weeks) and build a large mound, then lay eggs within the pile, and defend it for some time afterwards. They also lay large clutches of eggs, with reports of up to 70 eggs in a single clutch!